The BoxMaster® is a new form of boxing style conditioning that will wow your clients. With the ability to cater to all types of members, the BoxMaster will excite and encourage greater participation in boxing style fitness training. 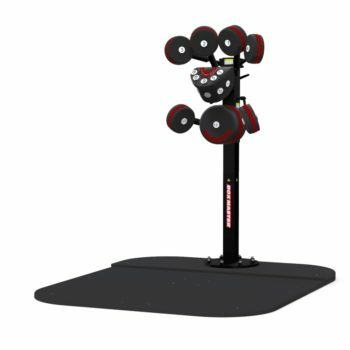 For the first time ever, the BoxMaster creates the ultimate boxing training station. The key to its design is the spring system attached to each pad. These springs have been designed to replicate punching a focus mitt, by offering a slight “give” in the pads on impact. Each pad has been positioned specifically to replicate different styles of punching, allowing the participant to throw any punch, or any combination of punches. The result is a significant reduction in the risk of injury to both the members and the instructor while delivering an unparalleled boxing experience. This truly unique product combined with its effective program will change the face of fitness boxing. In roughly 30 minutes you will experience a workout like no other. A 5-minute warm up followed by 7 active punching rounds and 7 active recovery rounds each 90 seconds long. Through the course of this workout you will hit every aspect of conditioning training both aerobically and anaerobically in an interval format like no other.